The Makita 8.3 Amp Demolition Hammer (model HM0810B) is built around a powerful motor that delivers up to 5.6 ft. lb. of impact energy (7.6 Joules) and 2,900 BPM for fast, efficient work. An anti-vibration spring works in concert with a soft-grip, 360-degree rotating handle for improved comfort and lessened fatigue. This hammer includes a hex wrench and case for added value. 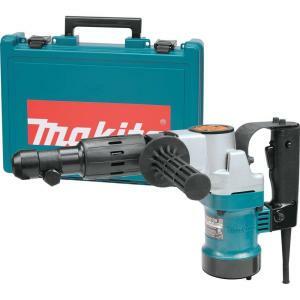 Tbook.com crawls the web to find the best prices and availability on Hammer Drills and related Tools and Hardware products like Makita 8.3 Amp 3/4 inch Hex Corded 11 lb. Demolition Hammer Drill with Tool Case. For this page, related items include products we find that match the following keywords: "Hammer Drill" at our vendor partner Home Depot. Makita 8.3 Amp 3/4 inch Hex Corded 11 lb. Demolition Hammer Drill with Tool Case is one of 148 Hammer Drills and related products listed in the Tools and Hardware section of Tbook.com If you have any questions on this product, please give us a call at 734-971-1210 during the hours of 9am - 5pm EST for assistance. Thank you for shopping at Tbook.com, the Internet Department Store!